HUMᗄNS–The award-winning British science fiction television series exploring humans living with cyborg technology and living as borg is finally returning next month to AMC. Viewers in the States have not seen an episode of the series since the first season finale in August 2015. The eight-episode second season just aired in the UK. Below is a video segment featuring the new characters introduced in season two, including a new artificial intelligence scientist played by Carrie-Anne Moss (The Matrix, Jessica Jones, Chuck). Season two picks up several months after the first season. 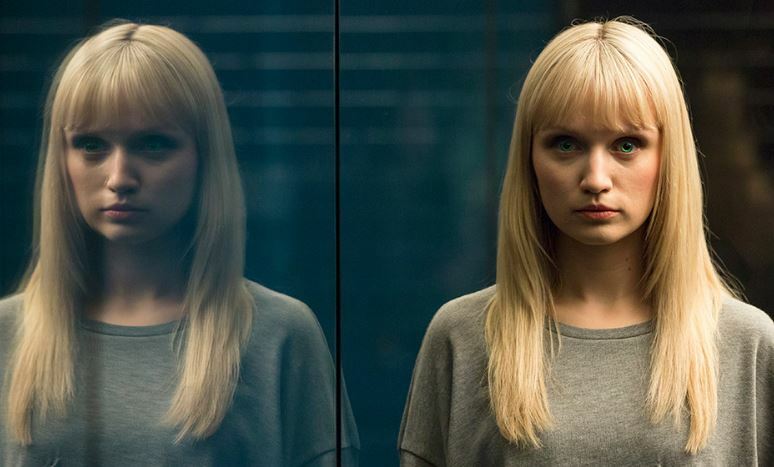 Synth Niska (Emily Berrington) has not yet been found, and her synth circle of friends Mia (Gemma Chan), Leo (Colin Morgan), and Max (Ivanno Jeremiah) struggle to fit into human society. Joe (Tom Goodman-Hill) and Laura (Katherine Parkinson) return in season two, as do first season actors Will Tudor, Pixie Davies, Neil Maskell, Lucy Carless, Ruth Bradley, and Theo Stephenson. New regulars include Moss, Sam Palladino, Marshall Allman, Sonya Cassidy, Bella Dayne, and Letitia Wright. HUMᗄNS is based on the Swedish series Real Humans. Look for Season 2 of HUMᗄNS on Mondays premiering February 13, 2017, at 9 p.m. Central on AMC.